Sunday November 7th 1926 It was late when we had breakfast. I washed the dishes and Hattie went to S S. I went to church by street car. Ott brought us home. Cora had dinner ready. Lillian not here. I slept awhile in afternoon and wrote Winnie and Gertrude Mitchell. weather cloudy. Monday November 8th 1926 It was a dark rainy day. I was sewing for myself. Hattie went to The Home to a meeting and Shakespeare Club. Cora to a tea. I had a letter from Mattie Stitt. She is still in Los Angeles. I wrote her husband in evening. Listened to Radio. Tuesday November 9th 1926 It snowed last night and turned cold. I was sewing for myself all day. Hattie down town in the morning and out to supper. Cora not well today. I wrote Mattie Stitt and Joe Woolf. 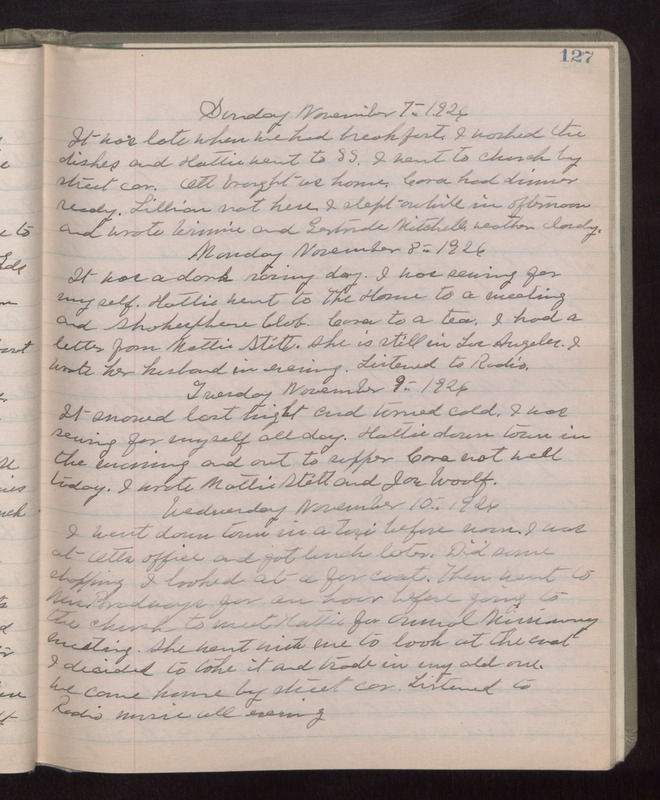 Wednesday November 10th 1926 I went down town in a taxi before noon. I was at Otts office and got lunch later. Did some shopping. I looked at a fur coat. Then went to Mrs Bradways for an hour before going to the church to meet Hattie for annual Missionary meeting. She went with me to look at the coat. I decided to take it and trade in my old one. We came home by street car. Listened to Radio music all evening.